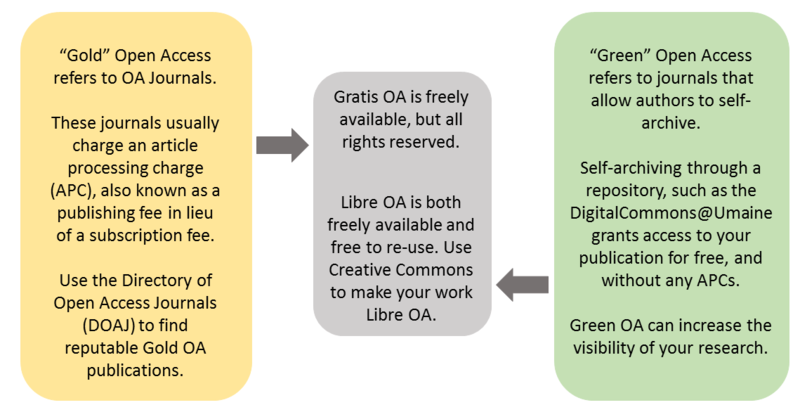 Open Access (OA) refers to the free, online availability of research outputs, coupled with the rights to use these outputs fully in the digital environment. This guide is designed to help researchers understand the different aspects of OA as it relates to scholarly communications at large. Have additional questions? Librarians can help you navigate the world of academic publishing! Please don't hesitate to reach out to your subject librarian. Scholarly publishing is one aspect of scholarly communications. Scholarly communications refers to the ways that research and scholarly works are created, evaluated, and disseminated to the scholarly community, as well as how those works are preserved in the academic landscape. Scholarly communication includes both formal channels, such as peer-reviewed journal publications and informal channels, such as websites and blogs (ARL definition). Researchers are studying the relationship between open access publishing and its potential for greater scholarly impact. Publishing in a green, open access journal allows authors to self-archive either the pre-print or post-print version of their manuscript and make it publicly available. Repositories by Discipline: Simmons College hosts this list of repositories by discipline. Includes sciences, social sciences, arts and humanities. Registry of Open Access Repositories: provides information about the growth and status of open access repositories from around the world, and links to them. DigitalCommons@UMaine: University of Maine’s open access institutional repository that provides access to the scholarly, educational, and creative works of the University of Maine community. To upload your work to DigitalCommons@UMaine, first create an account here. Not sure if you want to self-archive? Learn more at Why Archive, or contact your subject area specialist. Not sure if you have permission to upload your work? Check SHERPA/RoMEO for your journal's self-archiving and open access policies. NOTE: The use of Digital Commons to fulfill funding sponsors' open access requirements is intended for instances when a sponsor gives its funded researcher the latitude to select a repository(ies) in which to store and disseminate her/his subject research results. This is most likely to be the case with private sponsors. Federal funding agencies are required by law to designate the repository(ies) to be utilized. Because public access solutions vary by sponsor, researchers must pay close attention to proposal guidelines, award terms and conditions, and other sponsor-related communications to ensure they are complying with the requirements of their particular award. For more information about public access to the results of federally funded research please consult the US Agency Public Access Plans webpage which provides an up-to-date list of, and links to, U.S. agency plans as they are published. Steve Harnad's presentation, "Open Access: Green, Gold Gratis, Libre, North, South and How to Get There". SPARC (the Scholarly Publishing and Academic Resources Coalition) works to enable the open sharing of scholarly works. Online directory that indexes and provides access to open access, peer-reviewed journals. Hosted by Simmons College, this wiki provides links to a variety of open access book publishers. Check journals' self-archiving and open access policies. UnPaywall is a browser add-on for Chrome and Firefox that searches for legal self-archived versions of journal articles. Use this add-on to find green OA options. In general, predatory journals are those that attempt to exploit an author's desire to publish by employing questionable practices in pursuit of profit. Note: Fees to publish in open access journals help offset the costs of production and preservation, so an article processing fee alone does not suggest a journal is predatory. The University of Illinois at Chicago Library has put together a useful list of considerations to keep in mind when selecting a journal in which to publish. These principles of transparency are used by the DOAJ to evaluate journals accepted into the directory and provide valuable guidance for the critique of publications.